Many of you who know me understand and for those who wonder just allow the beauty to fill you with its energy. 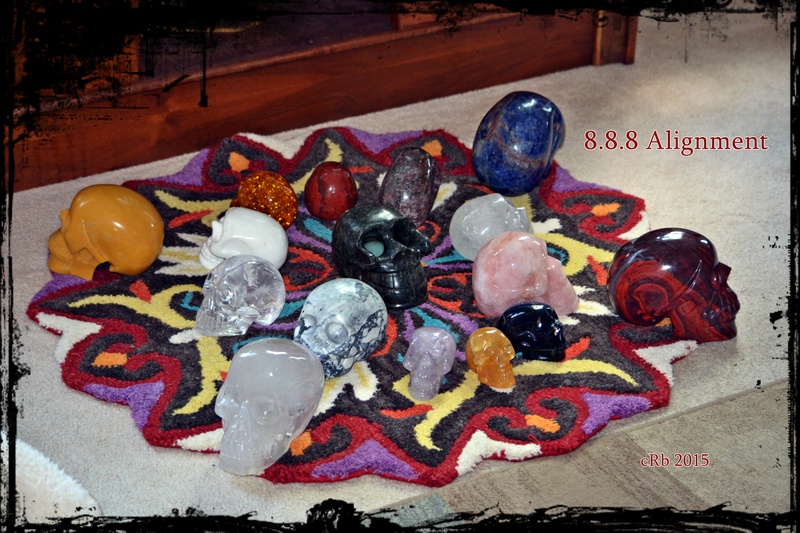 Under the direction of intuitive communication from the Crystal Skulls, I have formed a Grid which anchors the Crystalline Core of Mother Earth to the Galactic Alignment known as the 8.8.8 Lion’s Gate. Recognizing energy exists in everything, including people, plants, water, wind, planets and more, allows us to work with the energies to help us in a myriad of ways. This energy can help us release, heal and manifest. The energy of the Lion’s Gate is particularly strong. In numerology, the number 8 means abundance and prosperity as well as harmony, balance and power. Laying the number 8 on it’s side is the symbol for infinity. The number 8 energy provides us the opportunity to have endless flows of abundance and prosperity in many facets of life. All of this energy increasing and strengthening on 8-8-8 creates an extremely powerful time for co-creation and manifestation. August is the 8th month of the year, and this gateway happens on the 8 day of the 8th month in an 8 year, as 2015 in numerology adds up to 8. When the number 8 is doubled to 8-8, the energy increases and strengthens. Then tripled, it creates an even stronger vibration of the energies the 8 carries with it. This is all happening in the astrological sign of Leo, which is symbolized as a Lion. Thus, this day is called the Lion’s Gate. The Lion represents courage and strength. As a totem animal, it represents feminine strength, or the power of the Sun, which is feminine. Lions are also considered to be proud animals, thus the name “The Pride”. People who have Leo as a sun sign tend to like the limelight or being the center of attention, just as the Sun is the center of our universe. The energy of the Lion’s Gateway is about pure potentiality and endless possibilities. The gateway is a portal where energies of other higher dimensional galaxies pour into our planet and thus our lives. The energy is full of light codes meant to assist the transformation and evolution of our planet. Light codes are a type of language all their own. They are of a higher frequency and vibration than we have been experiencing to date on Mother Earth. They are meant to raise us up into higher dimensions. These higher dimensions are about Love and living as One, essentially delivering the message of Unity. Since 2012, we have felt many different energies building, helping to assist humanity in ascending into a more highly evolved, dimensional space of love, harmony and peace. The energies of the Lion’s Gateway are delivering us even more intense and powerful energies for us to use for transformation and manifestation personally and globally. For each individual, the energy asks you to step into your power, using your strength and courage to co-create whatever you wish with the energies. By moving forward into your authenticity, the energy offers endless possibilities. This is a time for creating or building upon your passions and purpose, which will then bring abundance and prosperity. It is about stepping into your own center and limelight, bringing your dreams to life. When you work with the energies in this manner, you are co-creating a better now and better future for yourself and all of those around you. Light workers during this time, and for years before, are serving as anchors to ground the higher vibrational energy into our world. Being a light worker myself, it has been energy wave after energy wave this year…this year of abundance. It’s both exhilarating and exhausting, as the human body attempts to adjust to these new frequencies and vibrations we are being sent. Light workers, light warriors and light bearers are all here working to assist the world in becoming a healthier, happier and heavenly place to live together as One. The energies of this 8-8-8 portal are for each of us to use to better ourselves, and our world, co-creating and manifesting our dreams. These energies deliver the message of Unity and co-creation, recognizing we are all interconnected. I’m honored to be a member of The Wellness Universe, which is entirely about co-creation, as we support each other’s businesses, messages and more of health and wellness in all areas. It is important to note this is the first of three days of this energetic power of the 8-8-8. The second occurs on August 17, 2015 (where 1+7 = 8) and the third on August 26, 2015 (where 2+6 = 8). Essentially, three days of the intense, wonderful energy & the power of Triple 8. May you use the energies to empower your abundance and prosperity, co-creating your passion and purpose, which helps lead to a world of Unity in harmony, balance, love and light. Heather Corinne Lang is a Reiki Master & Teacher, Yoga Instructor, Intuitive Guide, Tarot Reader and Ordained Minister. She offers private, group & corporate yoga, Reiki Energy, Life Coaching and Tarot Readings. With past lives as different types of Shamans, Healers and Medicine Workers, Heather brings knowledge and wisdom from this life time and past lifetimes to help guide you in your healing and transformational efforts.